Professor Efraim Inbar says Israel has no responsibility to aid Gaza, not providing aid may bring down Hamas. 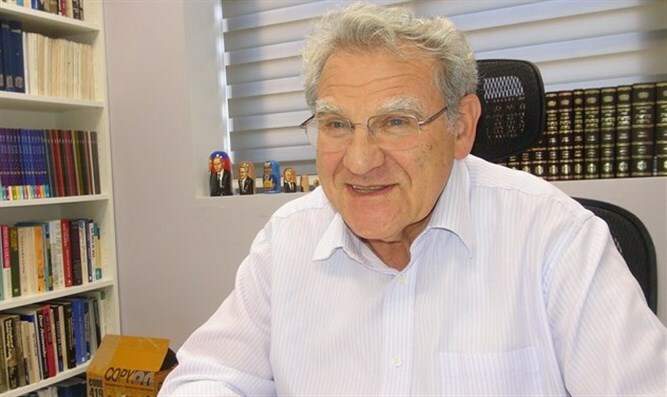 Jerusalem Institute for Strategic Studies President Professor Efraim Inbar told Arutz Sheva that in his opinion, providing humanitarian aid to Gaza is unnecessary and wrong. "We know what Hamas wants," Inbar said. "They want us to be in the sea. Hamas is utilizing Gaza's economic issues in order to receive more money and aid, and they use this situation and the suffering of Gaza residents in order to gain international attention. Hamas is responsible for this situation." "Even if there is a true humanitarian crisis in Gaza, it is not our responsibility to solve it. I do not understand the IDF commanders to push for international and Israeli aid for Gaza. At the end of the day, this just strengthens Hamas. I don't think we have any interest in strengthening Hamas' rule in Gaza." Inbar also believes that not providing aid to Gaza can change the situation for the better. "Pressure from below may well bring to a public protest, to tumult, and maybe to replacing the Hamas government. So there's no reason to help them. Hamas is our enemy. We are fighting them, and we need to remember that mercy has no place when dealing with those who seek our deaths." Regarding the issue of whether or not to apply Israeli sovereignty to Judea and Samaria, Inbar said that the legislative attempts are "a waste of Zionist energy." "Sovereignty is a political sentence that allows the government to employ government bodies to enforce the law. We know that Israel has sovereignty over the south, but from what I've seen, the Bedouin do what they want, and Israel's sovereignty isn't enforced. We need to first of all worry about rule, and then about sovereignty. The issue isn't sovereignty, it's making dumb proclamations that have no substance unless Israel actually does something. "We no longer bear the responsibility to give food or aid to Gaza, and we must not forget that Gaza chose Hamas as their leaders. Any aid will strengthen Hamas, and they want to eliminate us."